PVMBG reported that a phreatic eruption at the Sileri Crater lake (Dieng Volcanic Complex) occurred at 1342 on 1 April, ejecting mud and material 150 m high, and up to 200 m in multiple directions. The event was preceded by black emissions that rose 90 m, and then diffuse white emissions that rose 150 m. The report noted that there were not many tourists in the area due to rainy weather; tourists are not permitted within 200 m of the crater rim. Dieng has had a history of intermittent phreatic explosions. In 2017, explosions occurred on 30 April, 24 May, and 2 July (BGVN 42:10). Another phreatic explosion occurred on 1 April 2018. The volcano is monitored by the Pusat Vulkanologi dan Mitigasi Bencana Geologi (PVMBG, also known as Centre for Volcanology and Geological Hazard Mitigation or CVGHM). PVMBG reported that a phreatic explosion at the Sileri Crater lake (Dieng Volcanic Complex) occurred at 1342 on 1 April 2018, ejecting mud and material 150 m high, and up to 200 m in multiple directions. The event was preceded by black emissions that rose 90 m, and then diffuse white emissions that rose 150 m. The report noted that few tourists were in the area due to rainy weather; visitors are not permitted within 200 m of the crater rim. According to a news report (The Jakarta Post) that cited an official of the National Disaster Management Agency (BNPB), no toxic gases such as carbon dioxide, hydrogen sulfide, or sulfur dioxide were detected in the explosion. Information Contacts: Pusat Vulkanologi dan Mitigasi Bencana Geologi (PVMBG, also known as Indonesian Center for Volcanology and Geological Hazard Mitigation, CVGHM), Jalan Diponegoro 57, Bandung 40122, Indonesia (URL: http://www.vsi.esdm.go.id/); Badan Nasional Penanggulangan Bencana (BNPB), National Disaster Management Agency, Graha BNPB - Jl. Scout Kav.38, East Jakarta 13120, Indonesia (URL: http://www.bnpb.go.id/); The Jakara Post (URL: http://www.thejakartapost.com). PVMBG reported that since 20 September tremor and water temperature at Sileri Crater lake (Dieng Volcanic Complex) both declined. The Alert Level was lowered to 1 (on a scale of 1-4) on 2 October. PVMBG warned the public to stay at least 100 m away from the crater rim. PVMBG reported that during 8 July-14 September measurements indicated an increase in water temperature at Sileri Crater lake (Dieng Volcanic Complex) from 90.7 to 93.5 degrees Celsius. Soil temperatures also increased, from 58.6 to 69.4 degrees Celsius. At Timbang Crater temperatures in the lake increased from 57.3 to 62.7, and in the soil they decreased from 18.6 to 17.2. The report noted that conditions at Timbang Crater were normal. Temperature increases at Sileri, along with tremor detected during 13-14 September, prompted PVMBG to raise the Alert Level to 2 (on a scale of 1-4). PVMBG warned the public to stay at least 1 km away from the crater rim, and for residents living within that radius to evacuate. BNPB reported that a phreatic eruption at the Sileri Crater lake (Dieng Volcanic Complex) occurred at 1154 on 2 July, ejecting mud and material 150 m high, and 50 m to the N and S. The event injured 11 of 18 tourists that were near the crater. According to a news article a helicopter on the way to help evacuated people after the event crashed, killing all eight people (four crewmen and four rescuers) on board. PVMBG scientists visited the next day and observed weak white emissions rising 60 m. The report noted other events during the recent past; an event at 1303 on 30 April ejected material 10 m high and 1 m past the crater edge that formed a 1-2 mm thick deposit, and an emission at 0941 on 24 May consisting of gas and black “smoke” that rose 20 m. The Alert Level remained at 1 (on a scale of 1-4) and PVMBG warned the public not to approach Sileri Crater within a 100-m radius. PVMBG noted that due to decreased activity and no observable flow of gas in high concentrations from the crater the Alert Level for Dieng was lowered to 1 (on a scale of 1-4) on 11 August. Residents and visitors were advised to not enter the crater and to be vigilant if excavating to depths greater than 1 m around the crater. CVGHM reported that on 28 March gas emissions continued to be elevated at Timbang, a cone that is part of the Dieng Volcanic Complex. Plumes containing carbon dioxide drifted 2 km towards the S valley of Kali Sat, prompting a road closure until the early evening when the gas concentration decreased. On 30 March carbon dioxide gas emissions were not detected; however, "smoke" rose at most 100 m above the crater. Hydrogen sulfide odors were very potent in areas 1 km W and weak in areas 1.5 km S. On 19 April sulfur dioxide odors were reported. On 24 March Sileri Crater lake water changed from dark gray to brown. On 7 April white plumes rose 50 m and the water color returned to normal. Diffuse white plumes rose 15 m on 20 April. Other craters had not exhibited any changes by 28 April. Based on gas concentrations, seismicity, and visual observations, CVGHM raised the Alert Level to 3 (on a scale of 1-4) on 8 May and warned the public not to approach Timbang Crater within a 500-m radius. CVGHM reported that during 10-26 March gas emissions continued to be elevated at Timbang, a cone that is part of the Dieng Volcanic Complex. Plumes containing carbon dioxide and hydrogen sulfide drifted 2 km, and were toxic at a distance of 550 m. Seismicity increased during 13-26 March and then significantly increased on 27 March. CVGHM raised the Alert Level to 3 (on a scale of 1-4) on 27 March and warned the public not to approach Timbang Crater within a 1 km radius. CVGHM reported that during 31 May-10 June carbon dioxide gas emissions declined from Timbang, a cone that is part of the Dieng Volcanic Complex. Seismicity decreased during 5-7 June and was not detected during 8-10 June. White plumes were not observed. On 10 June the Alert Level was lowered to 2 (on a scale of 1-4). CVGHM reported that during 29 May-5 June carbon dioxide gas emissions from Timbang, a cone that is part of the Dieng Volcanic Complex, remained elevated. Seismicity for Dieng also remained high. During 4-5 June white plumes from Sileri crater rose 20-60 m high and white plumes from Timbang rose only 2 m and drifted 300 m S. The Alert Level remained at 3 (on a scale of 1-4). CVGHM reported that on 29 May gas plumes rose 50 m above Timbang, a cone that is part of the Dieng Volcanic Complex. The gas plumes drifted S through the valley. Observers who visited the cone noted damaged vegetation and dead birds. Seismicity and carbon dioxide gas emissions remained elevated. CVGHM raised the Alert Level to 3 (on a scale of 1-4). According to news articles, about 1,200 people were evacuated from the flanks. CVGHM reported that during 18-22 May seismicity at Dieng Volcanic Complex increased. On 22 May diffuse white plumes rose 20 m from the Timbang cone; plumes from the cone had not been previously observed. The next day carbon dioxide gas emissions increased. CVGHM raised the Alert Level to 2 (on a scale of 1-4). CVGHM reported that on 26 September a "thunderous" noise from Dieng was heard from 2 km away. The next day, a phreatic eruption from an unspecified crater ejected mud as far away as 140 m S. The deposits were as thick as 10 cm near the vent and 1 cm near the farthest point. The Alert Level remained at 1 (on a scale of 1-4). CVGHM reported that on 15 January two minor phreatic eruptions from Dieng's Sibanteng crater ejected material that fell within a 50 m radius. The ejecta and a landslide dammed up an area of the Kali Putih River. The Alert Level was raised to 2 (on a scale of 1-4) due to increased activity from Dieng and the potential for flash flooding from a dam breach. A pilot reported a plume from Dieng at 1029 on 13 May to about 3 km altitude (10,000 feet). Ash was not identified in satellite imagery a little more than an hour later. Mud flowed from Dieng's Sileri crater during the night of 20 July, traveling as far as 25 m S of the crater rim. The temperature of the crater on 21 July was 74° C, which had not increased much since last measured. On 22 July the Alert Level at Dieng was raised to 2 (on a scale of 1-4). On 24 July at 0730 mud flowed as far as 50 m from the crater towards the N and E. Mud bubbled up to 1 m high in the center of the crater. No heightened seismicity was recorded during either mud-flow event. According to news reports, the crater was closed to tourists. During 19-24 April, there was an increase in the number of deep and shallow volcanic earthquakes at Dieng in comparison to previous weeks. A small steam cloud rose 20-25 m above Sileri crater and temperatures taken at several crater lakes on the 20th and 21st had not increased. The volcano was at Alert Level 2 (on a scale of 1-4). Gas containing CO2 and H2S was ejected from Sinila Crater at 0330 on 20 February, killing (at latest report) 182 persons and injuring about 1,000, over 100 of whom had to be hospitalized [but see 4:3]. A police colonel said that 17,000 people had been evacuated from six villages near Sinila. A number of livestock were also killed by the gas, and ponds near the crater were covered with dead fish. An AP wirephoto showed bodies of some of the victims, who did not appear to be burned, nor were they covered with ash. Nearby vegetation also appeared burned. 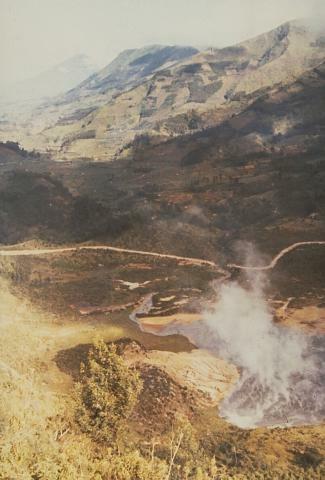 Many of the fatalities occurred in the village of Bandjarnegara, located in a valley on Dieng's SW flank. The gas emission from Sinila was preceded by seven felt earthquakes and followed by ejection of "smoke." UPI reported that "lava continued to pour over the slopes of the Dieng Plateau" on 20 February. 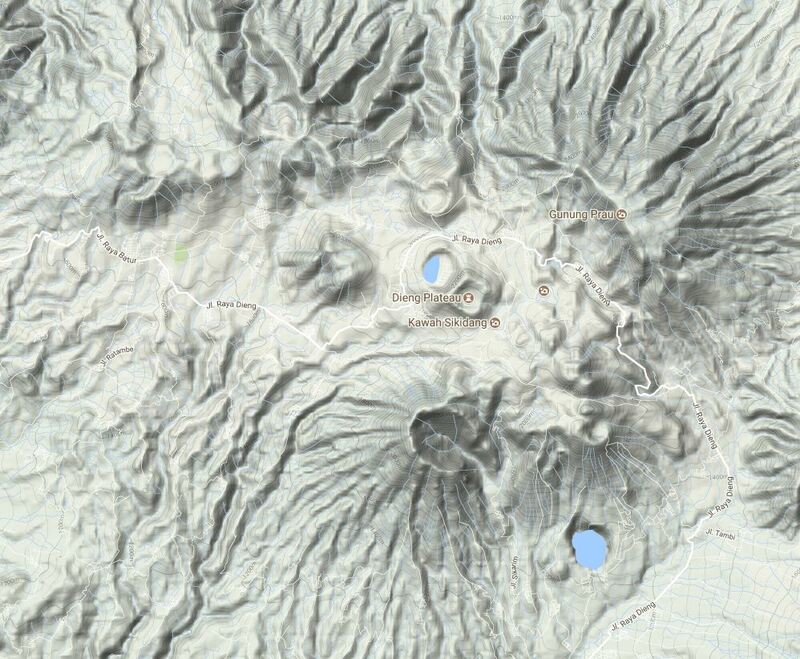 Sikidang Crater is located in the summit caldera, 27 km NE of Bandjarnegara, and is said to be 11 km from Sinila Crater. Information Contacts: AFP; Jakarta DRS; Antara News Agency, Jakarta; AP; UPI; Reuters; S. Russell, USGS. On 17 November an area of the Dieng volcanic complex with a history of poisonous gas emission experienced an MM 2-3 felt earthquake. A tripartite electromagnetic seismometer located the shocks in a zone of fractures and gas emission 1-2 km E of Batur. Newspapers and radio broadcasts reported that 3-12 seismic events were recorded during each of the 10 days ending 6 December. However, the number of events began to decrease in early December, and seismicity was continuing to decline as of the 17th. There were no indications of volcanic activity. The poisonous gas content of vapor sampled at several known emission sites had not changed more than 15% from previous measurements. The temperature of the pool of boiling mud at Sileri cone and the thermal feature Sikidang, a few kilometers E of the zone, remained unchanged at 90°C. Government officials issued an alert, but removed it after receiving a VSI report. Information Contacts: A. Sudradjat, VSI; Jakarta DRS. "A widely-felt earthquake occurred near Dieng on 13 April at 0747. Tremor was recorded for up to 10 minutes 14-15 April. Additional small earthquakes were recorded in the following two weeks. No changes were noted in thermal activity." Information Contacts: S. Siswowidjoyo and W. Modjo, VSI (as reported in BVE, no. 26, March 1989). A sudden gas emission occurred at about 1600 on 18 March from a fractured and altered zone in a river valley 200 m W of Sikidang Crater. After the gas emission, one person was found dead in the stream, and two others were hospitalized after trying to rescue him. Surface gas measurements the next day indicated high concentrations of CO2 and O2 (40 and 15 weight %, respectively), and lesser concentrations of H2S and HCN (200 and 197 ppm, respectively). Steam emission continued from Sileri Crater (~3 km NNW of Sikidang), rising 40-60 m in mid-April. An average of one A-type and seven B-type volcanic earthquakes were recorded daily during mid-April, an increase from earlier in the month. Information Contacts: W. Modjo, VSI; T. Casadevall, USGS. Hot mud began fountaining from a new vent (near the Pandawa Lima Temples) area at 0001 on 23 January. The fountaining was heard by residents of a nearby village (Bale Kambang). The hot mud, which emerged from a 5-m-diameter hole, had a temperature of 93°C and reached heights of 2-15 m. Hot mud and steam emissions were continuing on 8 February, with fountaining to 1 m height. The area within 25 m of the hole has been covered with mud. Gas measurements taken on 8 February detected 15 ppm HCN and 12 ppm H2S. Shallow volcanic earthquakes were recorded in January at rates of 3-20/day, but were decreasing prior to the 23 January activity. Seismicity has continued since then. Information Contacts: W. Tjetjep, VSI. Seismicity increased in late June and early July. Earthquakes of M ~2 were felt locally three times on 2 July, and once on 4 July. An emission plume of white, moderately thick steam without ash issued from Sileri crater under low pressure to a height of 50 m. There was a moderate smell of sulfur. The crater lake water was clear to gray in color with temperatures varying between 54 and 94°C. Information Contacts: R. Sukhyar, Director, Volcanological Survey of Indonesia (VSI), Bandung, Indonesia (URL: http://www.vsi.esdm.go.id/). The last reported activity at Dieng occurred during late June and early July 1998, when three M ~2 earthquakes were felt and a white steam plume was emitted from Sileri crater to a height of 50 m (BGVN 23:08). During April 2002, the Volcanological Survey of Indonesia (VSI) reported that activity at Dieng increased. Beginning on 19 April the number of deep and shallow volcanic earthquakes increased (table 1), and a white plume of variable thickness rose 25-50 m above Sileri crater. The temperatures of fumaroles in various craters were 50-95°C (table 2). Dieng remained at Alert Level 2 through at least 26 May 2002. Table 1. Earthquakes recorded at Dieng during 15 April through 19 May 2002. Courtesy VSI. Table 2. Temperatures of various craters of Dieng during 15 April through 12 May 2002. " --" indicates that the information was not reported. Courtesy VSI. Seismicity and plume frequency increased at Dieng beginning in April 2002 (BGVN 27:05). During 27 May-7 July 2002, the Volcanological Survey of Indonesia (VSI) reported higher-than-normal activity. Deep and shallow earthquakes were recorded, along with tectonic events (table 3). During 27 May-9 June, VSI reported a white plume from Sileri crater up to 50 m high. Observations in mid-June revealed a mud ejection from Sikidang crater. Dieng remained at Alert Level 2 (on a scale of 1-4). No further reports were issued through at least May 2003. Table 3. Earthquakes recorded at Dieng during 27 May-7 July 2002. Courtesy VSI. According to the Volcanological Survey of Indonesia (VSI), on 20 July 2003 mud poured from Sileri crater. The crater contains a lake and boiling mud pots, and has been the site of small-to-moderate historical eruptions. The incident of 20 July occurred at night and sent mud as far as 25 m S of the crater rim. On 21 July, a temperature measurement of the crater recorded 74°C, no striking increase from earlier measurements. On the morning of 24 July, another mud outpouring from the crater covered an area up to 50 m N and E of the crater rim. Activity then continued with small areas of mud bubbling and ejecta thrown 1 m high at the middle of the crater. Neither of the mud-outpouring events were recorded on the seismometer 1.1 km S of the crater. The volcano's hazard status was raised to level 2 on 22 July. The Volcanological Survey of Indonesia (VSI) activity report for the week of 4-10 August 2003 noted, for the Sileri crater in the Dieng volcano complex, one shallow volcanic earthquake, a white gas plume rising 25-60 m, and water temperature of 83°C. The hazard status was set at Alert Level 2 (on a scale of 1-4). Information Contacts: Dali Ahmad and Nia Haerani, Volcanological Survey of Indonesia (VSI), Jalan Diponegoro No. 57, Bandung 40122, Indonesia (URL: http://www.vsi.esdm.go.id/). This report discusses a small phreatic eruption at Dieng from Sibanteng crater in January 2009. The Dieng complex covers more than 80 km2 in Central Java NW of Yogyakarta. The volcanic field trends E and contains two or more stratovolcanoes, more than 20 craters and cones, several crater lakes, a caldera, and active thermal features (van Bergen and others, 2000). Phreatic eruptions are those that eject both magmatic gasses and steam, and contain fragments of pre-existing solid rock from the volcanic conduit or vent, but without primary erupted magma. Many of these eruptions are attributed to subsurface interaction between magma and groundwater (Germanovich and Lowell, 1995). Some are precursors to phreatomagmatic and magmatic eruptions. Recent reports discussed mud ejected from the active Sileri crater in July 2003 associated with a modest increase in seismicity and steam plumes during April-July 2002 and August 2003 (BGVN 27:05, 28:06, 28:07, and 28:09). 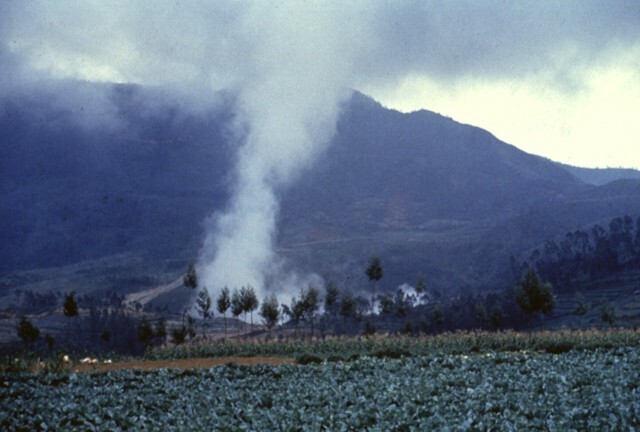 A May 2005 pilot report of a steam plume turned out to be caused by pipe maintenance at Dieng's geothermal site. January 2009 landslide and eruption. This event began when, after three days of heavy rain, one or more landslides broke loose in steep volcanic terrain at about the 1900- to 2000-m elevation at 0800 on 15 January 2009. Landslide debris covered the floor of Sibanteng crater, sealing the vent there. At 0830 a sudden and short-lived phreatic eruption took place. The alert level was raised to 2 (on a scale of 1 to 4). Much of these and other details were learned by an emergency response team from the Center of Volcanology and Geological Hazard Mitigation (CVGHM), who conducted a field investigation between 16-21 January. The team's findings are discussed below (as extracted from the CVGHM report dated 22 January 2009 ("Tanggap Darurat G. Dieng Kab. Wonosobo, Prov. Jawa Tengah, tanggal 16-21 Januari 2009"). The eruption left an explosion crater about 50 m in diameter and deposited the bulk of the erupted material in a ~ 50 m radius. The erupted deposits consisted of material from the landslide and vent area. This relationship indicated that the landslide preceded the phreatic eruption. The landslides covered an area 100 x 200 m, with an estimated 40,000 m3 of debris. In places, the landslide debris created temporary dams. One blocked the Kali Putih River, and downstream, the Kali Tulis River. On 17 January, four additional seismic stations were installed. Three were in the vicinity of the Sibanteng and Sikidang craters and one was near the thermally active colored lake Telaga Warna. Earthquakes and tremor were both absent on the seismographic record at Timbang crater during 17-20 January following the phreatic eruption. The team reported that witnesses in the field had heard two explosions. The first came from the landslide; the second, the phreatic eruption. During their visit, the eruption vent emitted a white plume 5 m high. The vent was largely covered by landslide debris from Sibanteng crater's upper wall. In Sibanteng and other craters temperature ranges were 93.2-93.6° C, values similar to previous data. The investigation indicated that the phreatic eruption was preceded by one or more landslides that covered the floor of Sibanteng crater. The team suggested that the sealing action and pressure buildup due to the landslide caused the phreatic eruption. They concluded that the phreatic eruption posed no danger to the public because the Sibanteng crater is not close to an inhabited area. However, they noted that landslide debris was still unstable and could be easily dislodged and transported by rainwater. Reference. Germanovich, L.N., and Lowell, R.P., 1995, The mechanism of phreatic eruptions: J. Geophys. Res., v. 100 (B5), p. 8417-8434.
van Bergen, M.J., Bernard, A., Sumarti, S., Sriwana, T., and Sitorus, K., 2000, Crater lakes of Java: Dieng, Kelud and Ijen, Excursion Guidebook, IAVCEI General Assembly, Bali 2000 (URL: www.ulb.ac.be/sciences/cvl/DKIPART1.pdf). This report describes a phreatic eruption at Dieng on 26 September, an event preceded by increased seismicity. Previously, a phreatic eruption on 15 January 2009 followed the burial and sealing of the floor of the Sibanteng crater by landslides (BGVN 34:04). 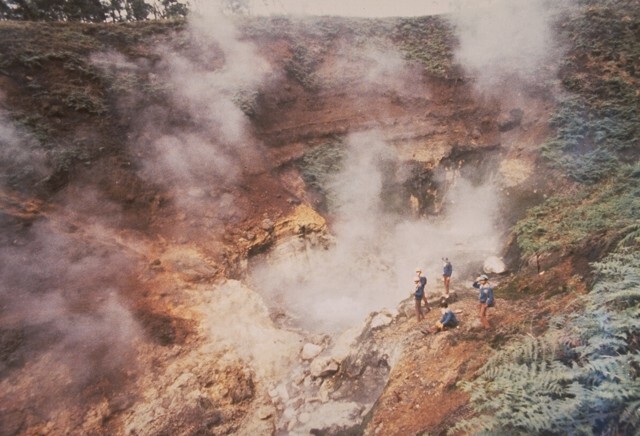 In the past, a large number of eruptions from the Dieng complex have been minor phreatic events (Germanovich and Lowell, 1995; van Bergen and others, 2000). Monitoring is carried out by the Center for Volcanology and Mitigation of Geologic Disasters (CVGHM) from the village of Karang Tengah. Seismic activity within the complex began in early September 2009. Four deep volcanic and two shallow volcanic earthquakes preceded a phreatic eruption on 26 September. On that day CVGHM reported a thunderous noise from Dieng heard up to 2 km away. The next day, a phreatic eruption from an unspecified crater ejected mud as far away as 140 m S. The deposits were as thick as 10 cm near the vent and 1 cm near the farthest point of deposition. Scientists did not observe an increase in the concentration of poisonous gases at either the vent or in the surrounding area. Located on an elevated plateau in central Java NW of Yogyakarta (figure 4), multiple craters within the Dieng Volcanic Complex (figure 5) have been intermittently active over the past 200 years. Brief phreatic eruptions took place at Sibanteng crater on 15 January 2009 (BGVN 34:04) and at Sileri crater on 26 September later that year (BGVN 34:08). Increased unrest during March-April 2013 (BGVN 38:08) consisted of elevated volcanic gas emissions from Timbang Crater that resulted in an increase in the Alert Level to as high as 3 on 27 March, then back to Level 2 on 8 May. There was a precautionary evacuation of local villages, but no eruption took place. Regular monitoring is done by the Pusat Vulkanologi dan Mitigasi Bencana Geologi (PVMBG, also known as Centre for Volcanology and Geological Hazard Mitigation or CVGHM). Figure 4. 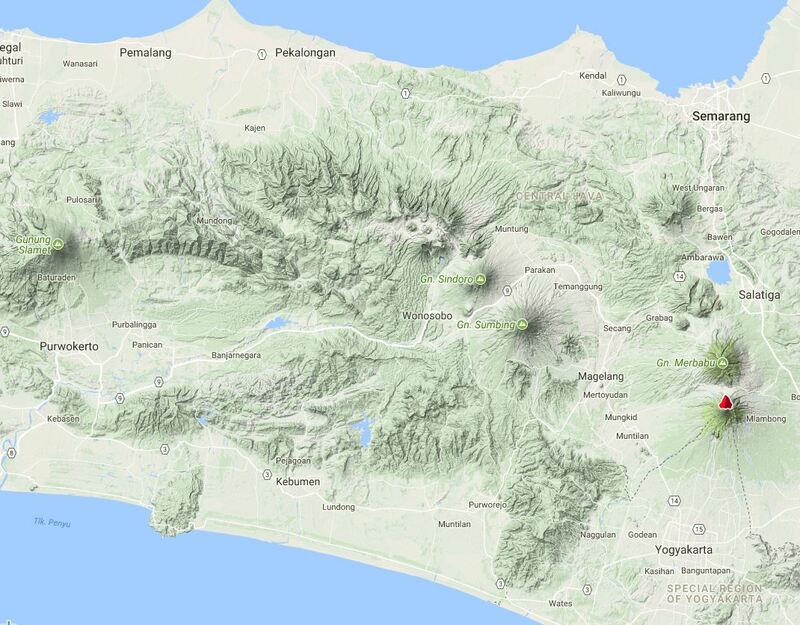 Topographic terrain map of central Java showing the Dieng Volcanic Province to the NW of Gunung Sumbing and Gunung Sindoro volcanoes. The volcano indicated by a red symbol N of Yogyakarta is Merapi. Courtesy of Peakery. Figure 5. Topographic terrain map of the Dieng Volcanic Province on the Dieng plateau of central Java. The notable cone at bottom center is Bisma; the crater with a lake at center is Merdada, adjoining Kawah Sikidang to the SE. The frequently active Sileri area is immediately W of the more noticeable Pagerkandang crater N of Merdada. Courtesy of Peakery. The alert status remained at Level 2 for about 15 months following the hazardous gas emissions in 2013. On 11 August 2014 the PVMBG noted that, due to decreased activity and no observable flow of gas in high concentrations from the crater, the Alert Level was lowered to 1 (on a scale of 1-4). No further activity was reported until late April 2017. A phreatic event from Sileri Crater at 1303 on 30 April 2017 ejected material 10 m high and 1 m past the crater edge, forming a 1-2 mm thick deposit. Another emission at 0941 on 24 May consisted of gas and black "smoke" that rose 20 m.
The Disaster Management Authority, Badan Nacional Penanggulangan Bencana (BNPB), reported that there had been another phreatic eruption from the Sileri Crater lake at 1154 on 2 July 2017, ejecting mud and material 150 m high, and 50 m to the N and S. The event injured 11 of 18 tourists that were near the crater. According to a news article a helicopter on the way to assist with evacuations after the event crashed, killing all eight people (four crewmen and four rescuers) on board. PVMBG scientists visited the next day and observed weak white emissions rising 60 m.
PVMBG reported that during 8 July-14 September 2017 measurements indicated an increase in water temperature at Sileri Crater lake from 90.7 to 93.5°C. Soil temperatures also increased, from 58.6 to 69.4°C. At Timbang Crater temperatures in the lake increased from 57.3 to 62.7°C, and in the soil they decreased from 18.6 to 17.2°C. The report noted that conditions at Timbang Crater were normal. Temperature increases at Sileri, along with tremor detected during 13-14 September, prompted PVMBG to raise the Alert Level to 2 (on a scale of 1-4). PVMBG warned the public to stay at least 1 km away from the crater rim, and for residents living within that radius to evacuate. However, after 20 September tremor and water temperatures both declined. The Alert Level was lowered back to 1 on 2 October, with a warning to stay at least 100 m from the crater rim. Information Contacts: Pusat Vulkanologi dan Mitigasi Bencana Geologi (PVMBG, also known as Indonesian Center for Volcanology and Geological Hazard Mitigation, CVGHM), Jalan Diponegoro 57, Bandung 40122, Indonesia (URL: http://www.vsi.esdm.go.id/); Badan Nasional Penanggulangan Bencana (BNPB), National Disaster Management Agency, Graha BNPB - Jl. Scout Kav.38, East Jakarta 13120, Indonesia (URL: http://www.bnpb.go.id/); Peakery (URL: https://peakery.com/). The Dieng plateau in the highlands of central Java is renowned both for the variety of its volcanic scenery and as a sacred area housing Java's oldest Hindu temples, dating back to the 9th century CE. The Dieng volcanic complex consists of two or more stratovolcanoes and more than 20 small craters and cones of Pleistocene-to-Holocene age over a 6 x 14 km area. Prahu stratovolcano was truncated by a large Pleistocene caldera, which was subsequently filled by a series of dissected to youthful cones, lava domes, and craters, many containing lakes. Lava flows cover much of the plateau, but have not occurred in historical time, when activity has been restricted to minor phreatic eruptions. Toxic gas emissions are a hazard at several craters and have caused fatalities. The abundant thermal features and high heat flow make Dieng a major geothermal prospect. Harijoko A, Uruma R, Wibowo H E, Setijadji L D, Imai A, Watanabe K, 2010. Long-Term Volcanic Evolution Surrounding Dieng Geothermal Area, Indonesia. Proceedings World Geothermal Congress 2010, Bali, Indonesia, 25-29 April 2010. Le Guern F, Tazieff H, Faivre Pierret R, 1982. An example of health hazard: people killed by gas during a phreatic eruption: Dieng Plateau (Java Indonesia), Feb 20th 1979. Bull Volcanol, 45: 153-156. Sukhyar R, Sumartadipura N S, Effendi W, 1986. Geologic map of Dieng volcano complex, central Java. Volc Surv Indonesia, geol map. Van Bergen M J, Bernard A, Sumarti S, Sriwana T, Sitorus K, 2000. Crater lakes of Java: Dieng, Kelud, Ijen. IAVCEI General Assembly, Bali 2000 Excursion Guide, 42 p.
Volcanological Survey of Indonesia, 1986. Annual report of the Volcanological Survey 1984-1985. Bull Volc Surv Indonesia, no 113. There is no Deformation History data available for Dieng Volcanic Complex. There is no Emissions History data available for Dieng Volcanic Complex. 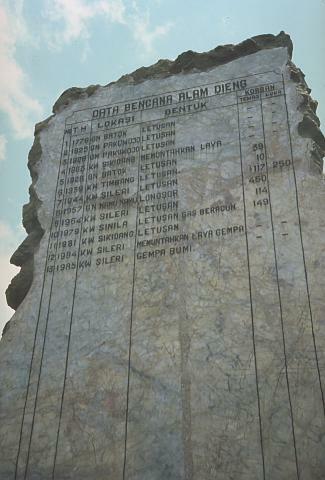 A stone monument is inscribed with a list of eruptions from the Dieng volcanic complex in central Java. The second column from the right lists fatalities (most recently 149 in 1979), which have occurred many times as a result of phreatic explosions and toxic gas emissions. The designers of the monument have somewhat ominously left abundant space to record future events. Hydrothermally altered ground marks the site of Kawah Pakuwaja (also spelled Pakuwojo), one of the many craters dotting the Dieng Plateau. The crater cuts the summit of Gunung Pakuwaja, one of the larger cones of the Dieng volcanic complex, located NE of Gunung Bisma. Kawah Pakuwaja is one of the most active craters of Dieng volcano and has produced several phreatic explosions during historical time. 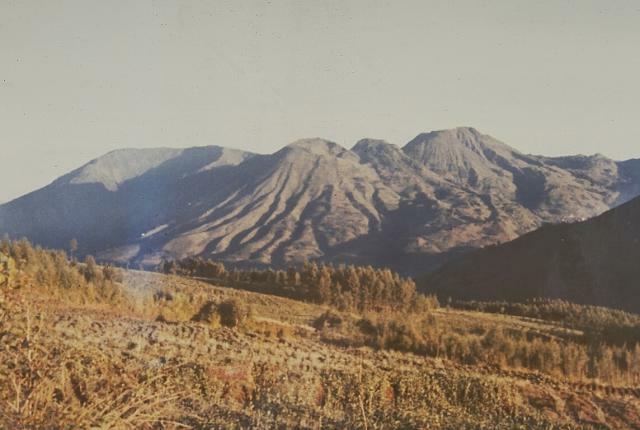 Photo by Sumarma Hamidi, 1973 (Volcanological Survey of Indonesia). Scientists from the Volcanological Survey of Indonesia monitor the steaming Candradimuka crater in the Dieng volcanic complex of central Java. The Dieng plateau is dotted with phreatic explosion craters, many of which have erupted during historical times, sometimes with fatal consequences. 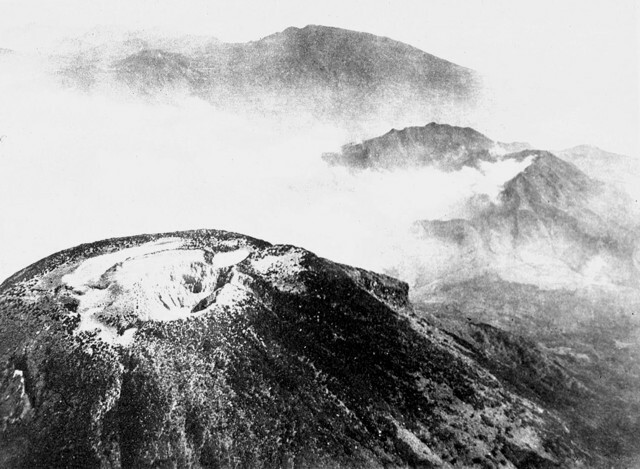 The only known eruption in the Kawah Candradimuka area took place in December 1954, when a brief eruption was observed that ejected thick black smoke for half an hour. Steam rises from the Kawah Sikidang thermal area, one of the most visited in the Dieng volcanic complex. 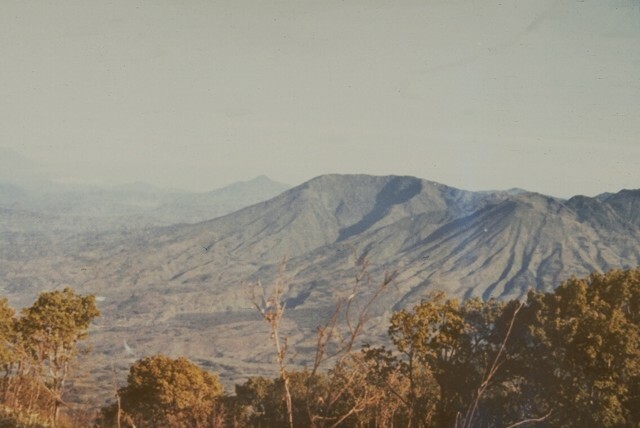 Gunung Bisma rises in the background to the SW. Kawah Sikidang is one of several craters at Dieng that have produced phreatic eruptions during historical time. Kawah Sileri is one of many craters in the Dieng volcanic complex that have erupted in historical time. 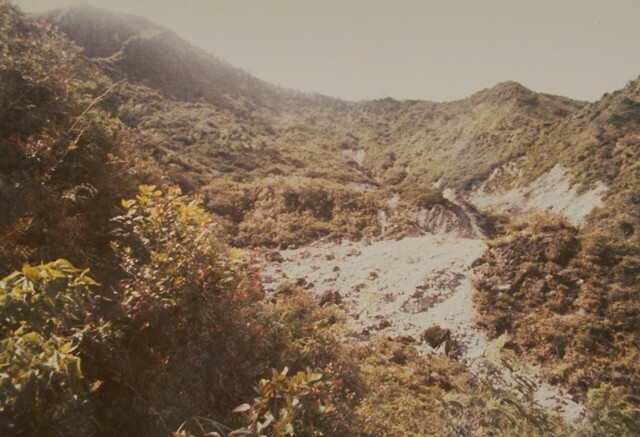 This 1973 photo shows the steaming crater where a brief 2-3 minute explosive eruption on 13 December 1964, killed 114 people. Kawah Sileri, located NE of the village of Dieng, is one of the northernmost craters in the Dieng complex. Gunung Bisma (center), seen here from the east, is a small andesitic stratovolcano cut by a large erosional valley on the SE side. The 2365-m-high Gunung Bisma is one of the more prominent features on the southern side of the Dieng volcanic complex. The ribbed cone to the right of Bisma is Gunung Seroja. The volcanic terrain of the Dieng plateau, the "Abode of the Gods," contains the oldest temples in Java. The Dieng volcanic complex, seen here from the SE, consists of two or more stratovolcanoes and numerous small craters and cones of Pleistocene-to-Holocene age over an area of 6 x 14 km. Minor phreatic eruptions have occurred in historical time, sometimes associated with toxic gas emissions. A steam cloud rises above Kawah Sileri crater in the Dieng volcanic complex. The slopes of Gunung Prahu lie behind Kawah Sileri to the NE. 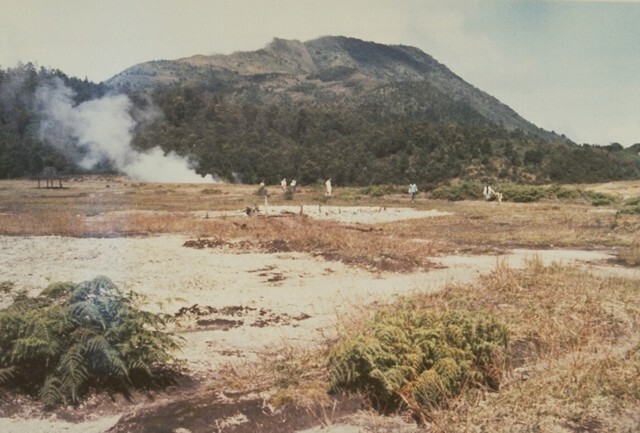 Kawah Sileri is one of many Dieng craters to have erupted in historical time and was the site of a relatively small but devastating eruption in 1964 that killed 114 people. An aerial view from the SE looks across the summit crater complex of Sundoro volcano to the Dieng volcanic complex. Several historically active craters and fissure vents cut the summit of symmetrical Gunung Sundoro. The forested peak at the top center is Gunung Prahu, the largest stratovolcano of the Dieng complex; to its left in the clouds is the Dieng Plateau, the location of many maars and phreatic explosion craters. There are no samples for Dieng Volcanic Complex in the Smithsonian's NMNH Department of Mineral Sciences Rock and Ore collection. Large Eruptions of Dieng Volcanic Complex Information about large Quaternary eruptions (VEI >= 4) is cataloged in the Large Magnitude Explosive Volcanic Eruptions (LaMEVE) database of the Volcano Global Risk Identification and Analysis Project (VOGRIPA).